Copper or Brass Bowl Chandelier. Art Deco light. Hospitality lighting. Inspiration for the Copper or Brass Bowl Chandelier with Raw Rock Crystal Chains came from luminaires of the Art Deco period (c.1908 to 1935). Art deco began in Europe, particularly Paris, in the early years of the 20th century, but didn’t really take hold until after World War I. It reigned until the outbreak of World War II. One of its major attributes was an embrace of technology. It has been defined as an assertively modern style that emphasizes symmetry rather than asymmetry, and the rectilinear rather than the curvilinear. During its heyday, Art Deco represented luxury, glamour, exuberance, and faith in social and technological progress. Trimmed with clear quartz “pebble” chains, the Copper or Brass Bowl Chandelier is reminiscent of chandeliers found in old Paris. The bowl is handcrafted from robust 18 gauge copper or brass sheet and then lightly distressed and antiqued. The natural beauty of rock crystal is enhanced when the eight internal lamps of this luminaire are turned on. Custom sizing is available. 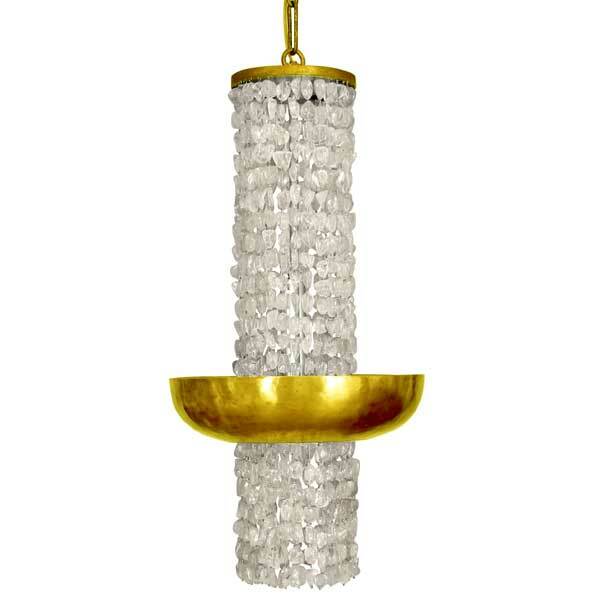 The Copper or Brass Bowl Chandelier with Raw Rock Crystal Chains was designed by Shah Gilani, ASFD.